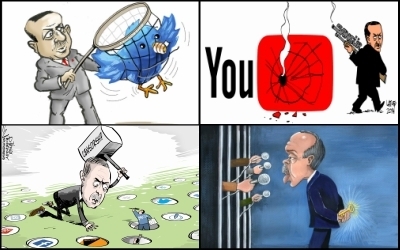 Turkish President Recep Tayyip Erdoğan's obsession with censoring his critics is legendary. Turkish president Recep Tayyip Erdoğan often seems to fancy himself a world-striding figure capable of bullying anyone, anywhere he likes. As the world saw this past May, when his security forces launched what police called a "brutal attack" against peaceful demonstrators outside the Turkish ambassador's residence in Washington, D.C., opponents of his dictatorial regime have good reason to fear for their safety, even in America. Tuesday afternoon, however, Erdoğan saw that his self-regard was no match for liberty buttressed by resolve: The Middle East Forum (MEF), a Philadelphia think tank, rejected his demand to disinvite a Turkish dissident, Emre Çelik, from addressing a conference of thirty members of the Political Committee of the Parliamentary Assembly of NATO that MEF sponsored — at NATO's suggestion — on September 19, 2017. Çelik is president of the Rumi Forum for Interfaith Dialogue and Intercultural Understanding, founded by followers of the aging Muslim cleric Fethullah Gülen, Erdoğan's ally-turned-enemy, now living in exile in rural Pennsylvania. Erdoğan has lodged unfounded charges that Gülen and his followers were behind the failed coup attempt against his regime in July 2016. Erdoğan jailed thousands of Gülen's supporters and demanded his extradition. Demanding Çelik's exclusion violated the spirit of NATO. Çelik's presence on the program went unopposed throughout the summer. A line-up of speakers was formally accepted by all parties. Then, one week before the event, NATO PA told MEF that Turkey had written letters to NATO's Secretary General Jens Stoltenberg and Parliamentary Assembly President Paolo Alli, protesting Çelik's inclusion and demanding his withdrawal. NATO PA threatened to cancel if MEF didn't accede to this demand. This violated the spirit that NATO, an institution founded to defend Western civilization against dictatorial regimes, exists to serve. Membership in NATO confers responsibility for mutual defense in the face of external aggression; it does not obligate anyone to obey rogue regimes that retain formal membership in the alliance despite their oppressive actions at home and abroad. How can NATO combat a threat from without when a member state poses the same threat from within? 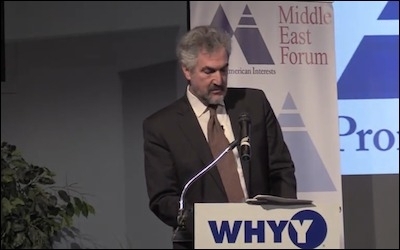 MEF president Daniel Pipes, in his keynote speech at the conference's conclusion, argued that NATO's primary task today is the defense of its members against the threat of Islamism, just as its founding mission had been a defense against communism. But Turkey's descent into Islamist despotism seriously distorts the NATO alliance: how can NATO combat a threat from without, Pipes asked, when a member state poses the same threat from within? Pipes told his largely European audience that when they leave the building in which they were meeting, they will see Independence Hall, the seat of American liberty where our founding documents were debated and adopted. "No one tells us what we can say," said MEF President Daniel Pipes. Just down the street sits the Liberty Bell, the symbol of American freedom. MEF, said Pipes, is grateful that Americans are a free people. "No one tells us what we can say," he emphasized; we are a free people, and we will act in complete freedom. When MEF invited Çelik, Pipes said, Ankara, 8,500 kilometers away, said no — and NATO PA dutifully fell into line by insisting that MEF cancel the conference rather than allow Çelik to speak. MEF at the time felt it had no choice but to remove Çelik from the schedule. But then, Pipes continued, "we recalled Independence Hall and the Liberty Bell," plus NATO's mission, and accordingly "Mr. Çelik is here and will address us." "He will become an American citizen within days, for which we congratulate him." And with that, Pipes asked the audience to welcome Çelik to the podium. As Çelik approached it, the Turkish delegation leapt to its feet and rushed the stage, while shouting that Çelik's appearance was "unacceptable" and that "he cannot be on the stage" (video of this episode is here). The Turkish delegation disrupted the proceedings and departed when Çelik was invited to the stage. 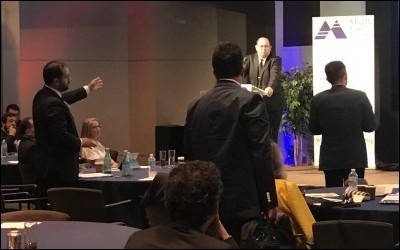 While voices grew heated, Çelik took a seat on stage alongside Pipes, while Michael Jopling of the British House of Lords, and co-chair of the NATO PA delegation, took the microphone to object to Çelik's appearance. He convinced the Turks to remain through his own talk about NATO's future, at the end of which he invited Ahmet Berat Çonkar, the top-ranking Turk in attendance, to speak even though he was not on the program. Pipes, however, was having none of this. He immediately joined Jopling at the microphone and pounded the podium, insisting that this was an MEF event and inviting Çelik to speak. Seeing himself outgunned (and outmanned), Jopling exited the stage. Free to speak, Çelik warned that the under Erdoğan's "new regime of repression," the "social mechanisms holding the nation together are falling apart." The purging of 120,000 government employees following last year's failed coup means that "more police counter-terrorism experts are in prison than ISIS members." A democratic Turkey is a must for NATO, Çelik said, both for the alliance's success and for Turkey itself. Those who most needed to hear — and heed — Çelik's words regrettably missed their opportunity. At the end of his brief talk, he received a standing ovation. Those who most needed to hear — and heed — Çelik's words regrettably missed their opportunity. When Çelik began to speak, the Turks — and the entire NATO PA delegation -- marched out, thereby allowing a distant despot to control their actions in the birthplace of liberty. NATO PA's willingness to ignore the principles NATO was founded to defend reveals the moral corruption at its heart; but on this day, those principles proved resilient in the face of tyranny. Winfield Myers is director of academic affairs at the Middle East Forum and director of Campus Watch, a project of the Middle East Forum.